For that old time malt shop favorite, a malted milk shake, try our Soda Fountain brand Malted Milk Powder. Commercial quality malted milk from one of the leading US manufacturers. The traditional taste of the malt shop and soda fountains will come alive in your malted milkshakes. This is a convenient 1 pound canister. Each sealed container comes with a reusable plastic lid. 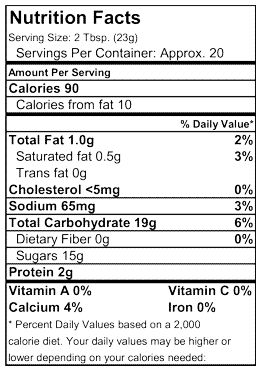 Wheat Flour and Malted Barley Extracts, Dry Whole Milk, Sucrose, Salt and Sodium Bicarbonate. Storage: Keep in a cool, dry location. Keep product tightly sealed for freshness. Having an uncle who was a respected chef in a number of Manhattan's best restaurants through the mid-1950's to late '60's, many did not know that he also "doubled up" as a great short order cook in diners at various times. As a pre-teen and adolescent, I was his "chief cook and bottle washer" while learning the restaurant trade from the ground up, and in the diners and luncheonettes, served as a fry cook and soda jerk. As the original meaning of the term suggests, I handled the fountain drinks which in time, became one of my fondest memories. Of course, the fast food industry has made it impossible to get a true malted milk or egg cream in the New York Metro area and what passes for "original" and "authentic" really isn't. Prairie Moon has made it possible through their Soda Fountain Malted Milk Powder, to prepare and enjoy what in our house constitutes the "real deal" for malted milk shakes. No special treat, the entire family thrives and enjoys this truly wonderful product on a daily basis. I have given quite a few canisters as gifts so that friends can enjoy it also. This was one of my recent "finds" that tops the list. Ordered on a Friday afternoon. Shipped Monday. Arrived Wednesday. Superb product with real Soda Fountain taste. The trouble now is that if I wanted to have one every night, I'd get fat in too much of a hurry. The Prairie Moon malt powder is the best tasting old time malt flavor I have found....a 5+. I was about 5 (1952)when I had my first chocolate malt and I loved them ever since, so I know what a good malt should taste like. I've notice from time to time that places that offer malts use this brand. This is the taste I've been trying to duplicate from my teen years. I wanted my grandkids to know what a real malt was, not that runny melted ice cream stuff. This is fabulous! We love this malt powder!! Since we've got it my son asks for a malt EVERYNIGHT!! I have been a fan of chocolate malts since I was a kid and I've turned my 10 year old into a fan as well! This is the first time we have been able to make our own because the only malt powder sold around here is at the bulk food product store. It is the carnation brand and I am not a big fan of the flavor of their malt. It seems to disappear faster than I had hoped and next time I will order more than a 1 pound container. The price was good but the shipping was more than the cost of the product which seemed high to me making my total over 20 bucks... But it was worth the price to us!!! Makes deliscious malts!! I remember when the malt shops had a 'malt' aroma in the air. The malt was a bit sweeter than what you have but awfully good. The cost of shipping is quite expensive. Maybe bulk packaging could be the answer in heavy duty plastic bags with a label. I was expecting a scoop inside the container. I think that your company may be small, in that you have to 'backorder' your products. Are you milling or just the distributor of the malt. Makes a big difference in price and delivery cost. Thank you for a trip down memory lane. -Richard. I was so happy to find a malt powder.. just remembering the 'gold ole days' sitting at the soda fountain sipping a malted milk. Prairie Moon delivered with just the right stuff. Smooth, sweet and wonderful malt flavor. Great treat and walk down memory lane, thanks. Greatest malt since I was a kid. Just wish it came in a larger quantity. LOVE IT! Used to make smoothies for two in blender. 20 oz Milk, 1/2 c creamy peanut butter, 1/2 c chocolate syrup, 3 scoops vanilla ice cream,1 tblsp vanilla flavoring and 2 scoops malt powder. Blend and enjoy. DELISH! The flavor of this malted milk powder is wonderful. It is so much better than the store bought brand(Carnation) there is no comparison. Met all expectations., will definitely purchase more. Was amazed that it tastes exactly the same as a restaurant malt. Only pennies a shake instead of dollars. I'll never need to buy a malted shake again. Thanks. We have been hooked on chocolate malts from Braums, but wanted to try to make them at home. 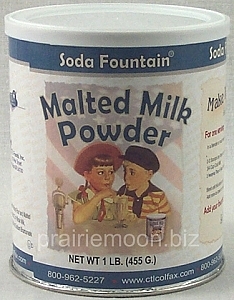 An Internet search led me to Prairie Moon malted milk powder and a recipe. Our homemade malts are delicious. Also, Prairie Moon shipped my order quickly. I would highly recommend this malted milk powder and Prairie Moon. A native of California and living in the wrong part of the country to get the west coast's well guarded secret, the "malt", I was thrilled to taste that old familiar and delicious flavor once more as I consumed my homemade version. The product is much better than the others that I have tried-the real thing. The one downer is the cost of postage which seems much too high, equal to the cost of the malt. Malted Milk Powder so good that I will Have to order another. Had to experiment to get the right taste. Item is well worth the price if you like old fashion Malted Milk Shakes. chocolate malts take me back to drug store soda fountain days..malted milk powder is ipossible to find in my local stores. I am so glad I found your product. It makes milk shake absolutely fabulous.